Ref: DTCL10 Superb antique reproduction extendable dining table. Available in mahogany, yew, oak, burr walnut and in a variety of wood shades. 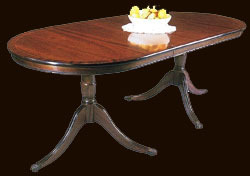 Bespoke and made to measure reproduction dining tables are available - please ask..